Epstein-Barr virus (EBV), known as the etiologic agent of infectious mononucleosis, is responsible for lymphoproliferation of B cells (Post-Transplant Lymphoproliferative Disorder (PTLD), Burkitt’s Lymphoma, Hodgkin’s lymphoma, …), a serious complication for immunocompromised patients. Optimized detection and monitoring of EBV infection is critical to ensure the best patient management. EBV-R-GENE® offers rapid and specific detection even prior to clinical symptoms, making it an ideal solution. This helps improve options for management, measure the effectiveness of treatment, and monitor for relapse. 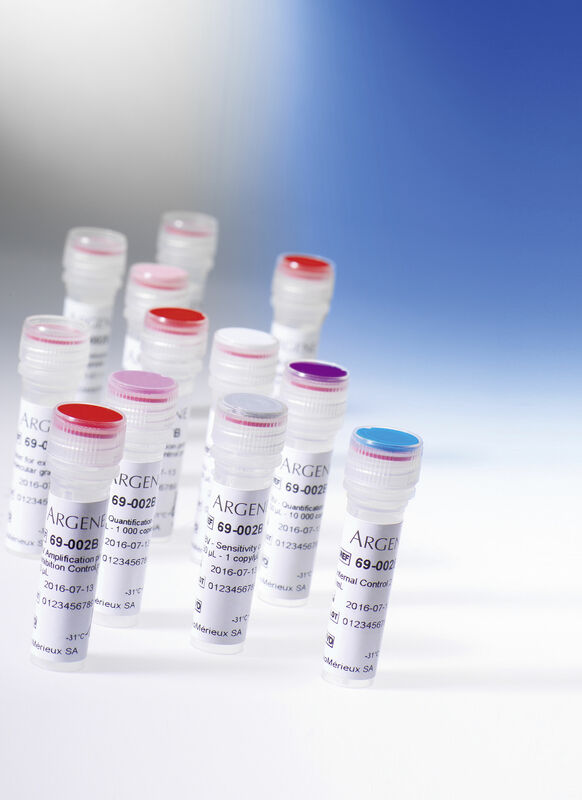 For even more comprehensive testing, you can use the broad R-GENE® range to quantify different viruses in one sample or analyze various samples for one virus at the same time. The ready-to-use EBV R-GENE® molecular detection kit measures EBV viral load in DNA extracts from different clinical samples. 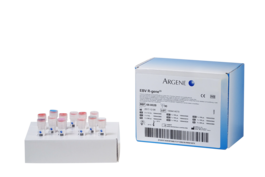 This 5’ nuclease-based real-time PCR assay amplifies a specific region of the EBV genome for detection and quantification of EBV. 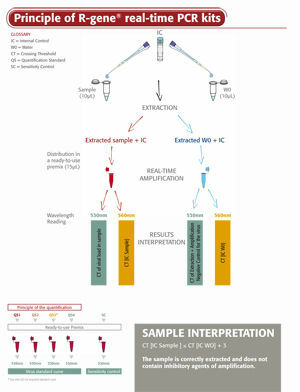 Using the EBV R-GENE® kit is so simple, all you need to do is add the sample extracted DNA to the ready-to-use PCR master mix and start the reaction on the appropriate Real-Time PCR thermocycler, following the optimized cycling program described in the “Instructions For Use”. BIOMERIEUX, the blue logo, ARGENE®,R-GENE®, EASYMAG® and NUCLISENS® are used, pending and/or registered trademarks belonging to bioMérieux, or one of its subsidiaries, or one of its companies. Epstein-Barr (EBV) virus is a ubiquitous herpesvirus which infects the majority of human population. After a primo infection (transmission by saliva), EBV remains latent in B cells and can periodically reactivate in healthy individuals. This reactivation occurs with a replication of EBV in the oropharynx and does not have any clinical signs. EBV is a causative agent for a variety of clinical conditions including infectious mononucleosis (IM) and several pathogenesis of cancers such as Burkitt's lymphoma, Hodgkin's lymphoma, and nasopharyngeal carcinoma. In immunosuppressed individuals, uncontrolled EBV-induced proliferation of B-cells results may also lead to post-transplant lymphoproliferative disorder (PTLD), which is an important cause of morbidity and mortality in both solid organ transplant recipients and HSCT patients. What are the benefits of EBV molecular testing? Real-Time PCR-based assays for EBV enable rapid and specific detection prior to clinical symptoms to help improve outcomes. This is especially important for immunosuppressed patients who are at risk of particularly severe consequences of infection. Quantitative EBV Real-Time PCR can be used to aid in the early diagnosis of PTLD, track the course of the disease, and monitor response to treatment. Need to calculate your conversion factor to express your EBV R-GENE® results in IU/ml? Please download a calculation protocol. Measurement of HSV1, CMV, HHV6 and EBV viral loads in 83 bronchoalveolar lavage (BAL) from lung transplant recipients. Laboratoire de Virologie, Hopital Debrousse, Lyon. Laboratoire de Bacteriologie-Virologie-Hygiène, Hopital Nord, CHU de Saint-Etienne, France. West Scotland Specialist Virology Centre, Gartnavel General Hospital, Glasgow, Scotland.